The mounds can be fascinating both in their appearance and in the earth history they tell. However, it is probably a mistake to consider a stromatolite as a fossil or even an organism; geologists prefer to refer to them as sedimentary structures or features. Nevertheless they do owe their existence to bacterial life. And I am claiming author’s license to tag them as fossils for this post. As it turns out the very same Cambrian Little Falls dolostone of the Beekmantown Group that hosts “Herks” also contains some rather spectacular stromatolite structures. You may have seen them when as you searched the boulders and outcrop at the Ace of Diamonds mine for vugs that might contain herkimers. You might have wondered what they were. But most will dismiss them as perhaps interesting, but generally uncollectible, falling within the general category of “leaverite”, or leave her right here. 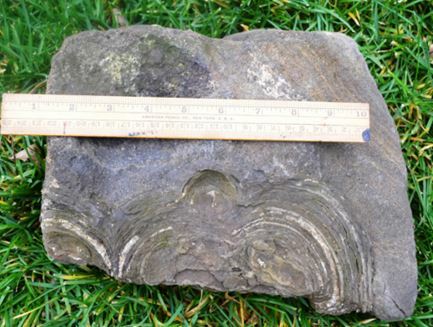 In their “raw” form, the Little Falls Cambrian stromatolites can be great garden rocks. This one has a special place in my vegetable garden. But they can also be polished to expose the layering. I wonder what a carefully oriented stromatolite sphere might look like. Perhaps I will find out one of these days with the club sphere machines. Geologically, and biologically, stromatolites are an incredibly important part of the rock record. They provide some of the oldest known evidence of prehistoric life. Stromatolites have been found in rocks older than 3 billion years in South Africa, Western Australia, and elsewhere (Schopf, J. W., et. al, 2007) providing proof of life on earth dating to almost 3.4 billion years. The mounded sedimentary features became ubiquitous within nearshore rocks in the Proterozoic Eon from 2500 to 542 million years ago, peaking in abundance about 1.25 billion years ago. The gradual decrease in stromatolites in the geologic record is thought to reflect the appearance and subsequent proliferation of grazing organisms capable of sustaining themselves on the slimy cyanobacteria and thereby limiting its preservation in the geologic record. Nevertheless the biologically based mounds do continue throughout the rock record. Other occurrences in New York include a Precambrian site just outside the Balmat Zinc Mine. The stromatolites at this location must predate the 1.1 billion year old Grenville orogeny that metamorphosed the region. A single stromatolite mound from outside Balmat Zinc Mine: Interestingly the fine layered features in the stromatolites from this location indicate that the section there has been completely overturned during the Grenville orogenic event (Bill DeLorraine, pers. comm.). Another famous New York occurrence is in the Late Cambrian Hoyt limestone in Saratoga County, in particular spectacular outcrops in Lester Park in Saratoga Springs (Friedman, 2000). The mounded algal mats depicted at the top of this article are from Petrified Sea Garden in Saratoga Springs, which I understand is currently closed to the public. Too bad. 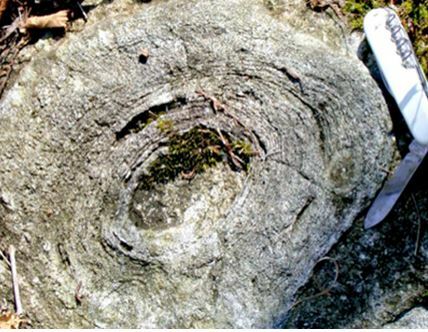 The spectacular cabbage shaped stromatolites in Saratoga County, NY were some of the first to be described and recognized as having a biologic origin. Hall (1847) considered them “remains of sea plants”. 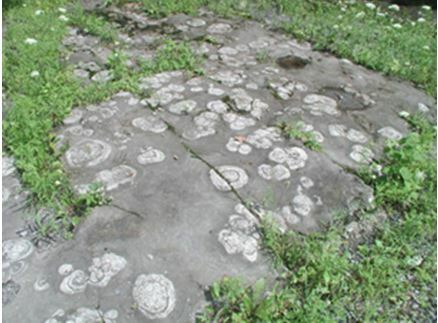 Although collecting is not permitted at the Balmat and Saratoga sites, there are stromalites in the Silurian Lockport dolostone exposed in Walworth, Penfield, and Lockport quarries, other sites where our eyes are typically averted to vugs and hidden crystals rather than to fossils or rock features. 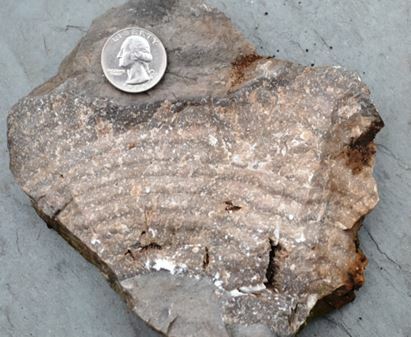 Next time you collect in your favorite Lockport Formation Quarry, you might look for one of these. This is the cross section of a stromatolite from Lockport Quarry. There are few occurrences of stromatolites in the modern record. In fact the first occurrence was not discovered until 1956 in a remote bay in Western Australia (Webb, 2002). The extremely high salt content in this lagoon is too high for grazing organisms to thrive and the biogenic slime is able to build into the layered mounds that were much more prevalent in prehistoric time. They have since been found in isolated protected saline bays in marine settings in the Bahamas and in Antarctica, in land-locked pools in the Seychelles reef and even in hot spring environments like Yellowstone, all places hostile to grazing life forms. Modern stromatolite mounds in Shark Bay, western Australia. 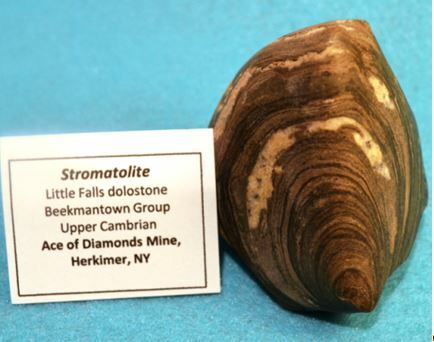 Maybe next time you venture into Herkimer County for “diamonds” you will take a minute to collect a stromatolite or two or six. Maybe on April 1, when WCGMC makes its annual opening day trek to Ace of Diamonds Mine, you will join me in collecting some. They won’t sparkle, and they probably won’t make it as a jewelry piece or into a mineral specimen cabinet. But they are a unique geologic entity, they do record a part of geologic history, and if you are creative with your cutting and polishing they can sculptured into an attractive cabochon or paperweight piece. And not everyone that goes to Herkimer County comes home with one! Hi, went to Herkimer KOA mine this September and came home with one .Had no clue what it was until I read your article,I just liked it cause it looked like petrified wood. After I cleaned it I noticed little tiny crystals in some spots.Thanks for the article.